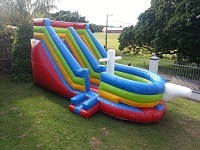 We have a fun range of Water Slides and Jumping Castles to choose from. Jumping Castles and Water Slides are hired out for the day. We have Slip' n slides, pool slides, turning slides and extreme slides. We will deliver to your venue, set-up and collect for a fee. The cost will vary according to the area to which we have to deliver. An extension cord will be provided only when using our delivery option. Another option would be to collect the inflatable yourself. 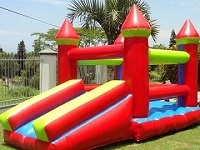 These castles and slides are large and heavy and will need to be transported in a van/bakkie. Please note: we do not supply extensions for this option. You will need a large space, preferably away from objects and a power point. A water tap and a hose pipe will be needed for the water slides. We have FUN FOAM CONCENTRATE which may be purchased to put onto the water slides for a "slippery slide ".